Content by Tony Macklin. Originally published on January 24, 2019 @ tonymacklin.net. Instagram has more than a billion active users. Wow! A few are entrepreneurs. Many are social lemmings. Many are adolescents just trying to find their identity. All live in a world of "followers." All want to belong. But, for better or worse, it's a world they can't always control, no matter how hard they try. The compelling documentary Social Animals is a sharp look into that world - both on screen and off. It shows the fallible, would-be wizards who live behind the screen. Social Animals focuses on three different teenagers and their life-changing experiences in the cyber universe. Each is from a different part of the country. Kaylyn Slevin lives in Southern California. Humza Deas lives in Astoria, Queens, New York. And Emma Crockett lives in Lebanon, Ohio. Kaylyn is blonde, rich and entitled - she expects to win the best trophy. She is a burgeoning fashion icon. She is young, idealistic, and sure of herself. Humza is more cautious, but as an urban-exploration photographer he received renown for his bridge climbing pictures. But when an ally is arrested, the Instagram universe turned on him as a "snitch." It didn't matter whether he was or wasn't. The universe had decided. The universe of Instagram was even more cruel to Emma. 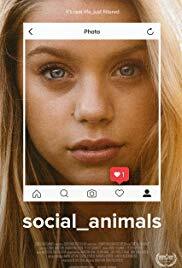 She is bullied and driven to extremes when her boyfriends dispose of her without any compunction.. Emma faces the worst that Instagram can dish out. All three young people are well-spoken and thoughtful. Social Animals is credited to three writers, but what did they write? We know that the bullies are actors, but the impact seems actual. Director Jonathan Ignatius Green has created a slick film, but its greatest asset is its humanity. The three main figures have a genuine quality that often is engaging. And the humiliation seems real. Green makes the world of Instagram authentic and relevant. I have a hard time imagining taking a selfie. One young person in Social Animals says about Instagram, that he did "anything I could do to stay in the crowd." I do anything I can to avoid "the crowd." An empty theater is my ideal. For me, that's the ultimate selfie. One shot in Social Animals had a strong resonance for me. It is in Bill's Doughnut shop in Dayton, Ohio, which is up the road from Lebanon, home of Emma. I used to spend my life at Bill's. I often witnessed a section of old white men sitting reading in their newspapers about the Stock Market, and arguing. Now at Bill's it's a crowd of yelp on Instagram. Times change. But, fortunately, doughnut shops are eternal.